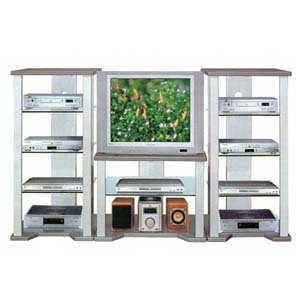 Grey/Silver Finish T.V. Stand. Easy To Assemble. Dimensions: 36W. X 20D. X 21H.. Also Available (Not Included In The Price) Grey/Silver Finish Side Pier 7267 (CO), Size: 24W. X 20D. X 49H. ; And Grey/Silver Finish Small Side Pier 7569 (CO), Size: 21W. X 19D. X 41H.. *Local Delivery Or Store Pick Up Only.